SICK Tim310-1030000 scans the perimeter of its surroundings at a single plane with the aid of laser beams. The TiM3xx measures its surroundings using two-dimensional polar coordinates based on its measurement origin. This is marked on the hood in the centre using a circular indentation. If a laser beam hits an object, its position in terms of distance and direction is determined. Scanning is performed across a 270° sector. The maximum range of the TiM3xx is 4 m (13.12 ft) on light, natural surfaces with an object reflectivity > 50 % (e.g. a white house wall). The TiM3xx emits pulsed laser beams using a laser diode. If one of these laser pulses hits an object or a person, this is reflected at its surface. The reflection is detected in the TiM3xx's receiver by a photodiode. The TiM3xx uses HDDM technology (High Definition Distance Measurement), a SICK own-development. Using this measurement method, a measured value is formed by the average value for several individual pulses. The TiM3xx calculates the distance to the object from the transit time required by the light from emission of the beam to receipt of the reflection. This principle of "time-of-flight measurement" is used by radar systems in a similar manner. angle increments using an angular encoder. average value from several pulses to determine individual measured values. 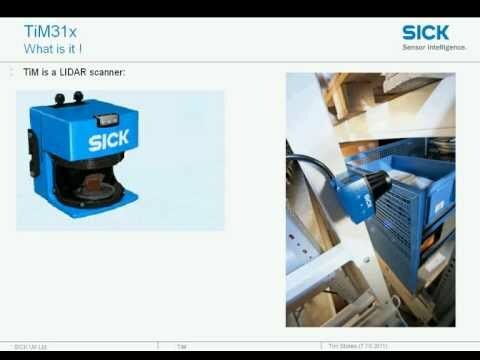 Configure SICK tim310 without a PC using "touch and teach"